Are you looking for a way to incorporate music into your love of God? If so, then you have probably considered taking musical lessons. Modern churches are always finding new ways to keep their younger members interested and many have turned to Christian music as a way to do so. Christian music is one of the most popular and fastest growing genres out there, so you will not have a problem finding Christian musician to emulate. However, many people get discouraged when they are first starting out, as the songs they are trying to learn are far too difficult for their skill level. That is why it is best to start with a few easy Christian guitar songs. 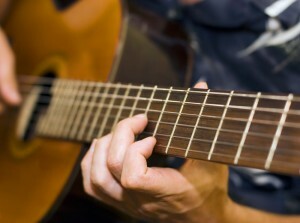 Here are ten easy Christian guitar songs that are great for beginners. You will have no problem finding tab, chords and even video lessons for all of these songs online. 1. “How Great is Our God” by Chris Tomlin. Now that you know some of easy Christian guitar songs to learn there is no reason not to get started. All of these songs have been well documented online with tabs, lyrics, chords and video lessons, so you can get started today!